On February 6, 2015, we received a reply the appeal of 21 January from the Chief of the Slutsk District Council of Deputies – Victor Razhanets. In fact, I discovered these important additions already on the evening of the 6th of January, visiting the site. But what is behind the mysterious streamlined phrase: «Reception of citizens by deputies … are organized in the most convenient time for them and voters. Admonitions on the matter to the District Council wasn`t received»? Monitoring of «Our House» showed that only one of the 40 deputies of the Council – Victor Gurynovich (Gatsukovsky electoral district №31) takes the voters in working hours from 10.00 to 11.00. And on our request for additional reception from 18.00 to 19.00 and in other day we received such complicated formal reply. During the registration of the appeal at the Secretariat of the Council, from unofficial sources we know that Gatsukovsky electoral district is the biggest: the distance between the villages is 6-7 kilometers. That`s why, supposedly, in the evening (in the dark) people will not go to the reception. Very strange logic. Firstly, do the voters have neither bicycles, nor motorcycles or cars ?! Secondly, how do the voters can get, and for how many time will they ask for leaving for a job to have an audience with deputy, if 6-7 kilometers are considered incredibly difficult obstacle ?! It is interesting to note that the deputy of Kozlovichskiy electoral district № 35 – also the same is not small – takes voters 2 times a month, morning and evening. The decision of Slutsk District Council «About the regional budget for 2015» will be published on the site after the compulsory legal expertise. Budgets for the previous years were also published, which is considered a big advantage: From 21 checking official sites were only 7 contains budgets. 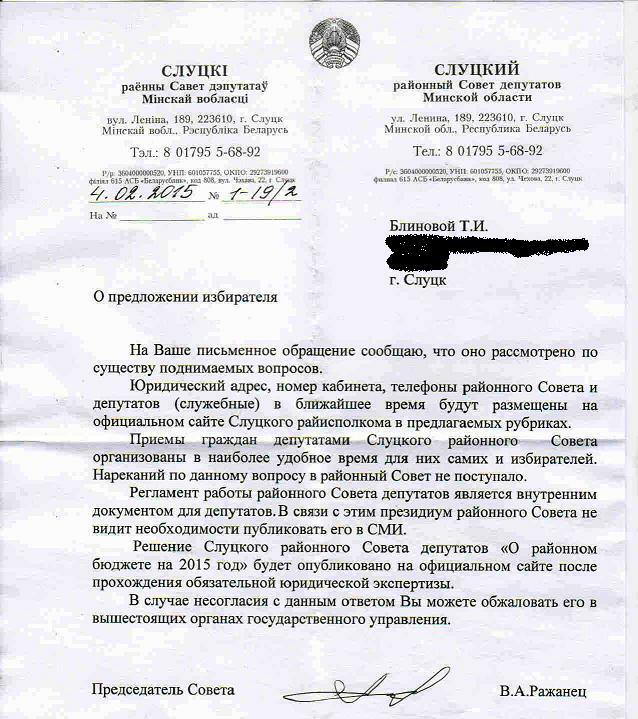 With regard to the Rules of the Council of «Presidium of the District Council sees no need to publish it in the media.» In this false secrecy, by the example of other local Councils we have seen direct infringement of the rights of citizens of the Republic of Belarus. Therefore, we will definitely come back to the topic of accessibility of Rules to the voters in the near future!